Rotary club of Williamstown sponsored 3 year 10 students to the Conoco Phillips Science fair at RMIT during January 2014. “I had a great time at the science fair and I would like to thank Rotary for the opportunity. We spent time at RMIT doing experiments in physics and chemistry. We were taken to the Bundoora campus where we worked in anatomy and nursing and we saw a cadaver. It was a fun and interesting experience. 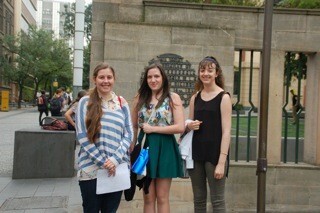 It also provided a chance to get a feel of the atmosphere at RMIT, and consider what it would be like to study at RMIT. "I loved learning about the different careers I could pursue in Science and also being able to experience things first hand. I was surprised how involved we got during each activity like during Chinese Medicine, making our own acne cream with all natural herbs and being able to touch real human dead bodies in the anatomy lab. I made lots of new friends and was always having fun and learning something new." "The science program was really exiting. i learned a lot about all the different pathways that science can take you. I met heaps of new people while learning about physics, chemistry, anatomy, and astrology. We got to meet a successful scientist who spoke to us about the benefits of being a scientist. Over all it was a very rewarding experience. Especially understanding what it would be like as a student at RMIT and all this courses that they have to offer."